You’ve probably heard it before; gluten-free, dairy-free diets are the healthiest way to eat; for a variety of reasons. Rather than go into a long, explanation of the benefits of going gluten/dairy free, I’ll let Alissa Segersten and Tom Malterre do it. In this wonderful cookbook, they give a general explanation of the foundations of health, the threats to those foundations, and the solution to the problem-all in one book and then they follow it up with over 300 delicious recipes. and the how of going gluten/diary free, Segersten and Malterre, both graduates of Bastyr University with advanced nutrition degrees, and with Segersten, a classically trained chef, the couple have created a wonderful resource with this cookbook. They’ve removed the gluten, dairy and soy from these recipes without removing the texture, flavor, good-taste and fun in these completely satisfying meals. Now there are no more excuses. Segersten and Malterre made it easy for you. It would be hard to narrow it down to my favorite recipes but I will give you three: Rice and Nut Milk Rice Cereal for breakfast, Hot and Sour Soup or Baby Arugula Salad with Zucchini-Lime Dressing (to which I add chicken) for lunch, and Garlic-Ginger Salmon for dinner with Coconut Almond Sugar Cookies for dessert. OK, so that’s 4; I couldn’t help it. Geared towards raising healthy children from pre-conception onwards, Nourishing Meals provides over 300 healthy gluten-free recipes and cited research to support your family in health and wellness. With autism rates rising, childhood obesity at an all-time high, and the ever-increasing rate of food allergies, they asked the question: How can we raise our children in the current environment so they can not only survive, but THRIVE? 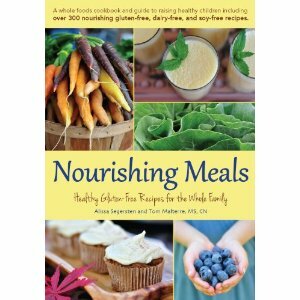 For more information about Nourishing Meals, check out my recommended reading page.